By Andrew Hampp and Andrew Hampp . Published on February 04, 2010. LOS ANGELES (AdAge.com) -- To encourage pet owners to drive its cars, Subaru has gone to the dogs -- literally. This weekend, the automaker will roll out a series of spots, created with Carmichael Lynch, Minneapolis, featuring all-canine drivers of the Subaru Forester under the tagline "Dog tested. Dog approved." Dogs are shown "driving" and even parallel parking their vehicles to tout Subaru's pup-friendly brand message. The spots will premiere during Animal Planet's "Dogs 101" marathon Saturday, with airings planned for Animal Planet's Sunday telecast of its sixth-annual "Puppy Bowl," National Geographic's "Dog Whisperer" marathon Feb. 15 and USA's coverage of "The Westminster Dog Show" Feb. 15 and 16. Subaru will also air different versions of the spots on its YouTube channel and on several key websites. Kevin Mayer, the car maker's director-marketing communications, said about half of Subaru's customers own a pet, and it indexes higher than most car makers with dog owners. At its most recent annual sales event, Share the Love, customers could choose one of five charities to donate $250 of their Subaru purchase. A large percentage of those donations went to the American Society for the Prevention of Cruelty to Animals, of which Subaru is an official sponsor. Beginning in 2008, the marketer started running print ads touting its ASPCA partnership that read, "Without dogs, how would you get rid of that new-car smell?" "We wanted to develop the next stage of that partnership. The idea was to emotionally connect with the customers, so we asked our agency to do something different in a way from the communication we typically have with them," Mr. Mayer said. The doggie outreach is the latest iteration of the "reverse upfront" integrated-marketing strategy Subaru started two years ago. The company meets with key media partners months before the marketplace formally moves to get first crack at key integrations and sponsorships. Deals with Animal Planet ("Groomer Has It," the "Dogs 101" marathon), Syfy (a co-starring role for the WRX in "Eureka") and History's "Expedition" were inked during that period. Although many of the partnerships feature specific Subaru vehicles, Mr. Mayer likes to keep a more holistic focus on Subaru's marketing. "Most of what we do is really at the brand level. Forester happens to be the lead vehicle in these [dog] spots, but it's really about the brand and connecting with the consumer to let me know we care about their passion points." And he's impressed by his latest "stars," pups Olive and Zelda, who showed natural acting abilities during Carmichael Lynch's brisk shoot. "The dogs were such good stunt dogs and did a lot of the facial expressions just naturally," he said. During one ad, where Zelda attempts to parallel park her Forester on a curb, "she had her tail between her legs. It's as if she knew what was going on." Subaru, Hershey and Mars are all preparing big ad buys for Super Bowl weekend -- but you won't find them on CBS. The marketers are the leading sponsors of this year's sixth annual "Puppy Bowl," airing Sunday at 3 p.m. EST on Animal Planet. Known in pet-owner circles as a fun, furry alternative to the Super Bowl, "Puppy Bowl" is a place for rescue puppies to compete for the title of MVP -- Most Valuable Puppy -- with more marketer involvement than ever this year. Hershey is sponsoring a Twizzler-branded blimp to shoot the telecast's first-ever aerial footage, as well as a Kit Kat Break during halftime, during which viewers will be entertained by -- what else? -- kitty cats while a referee enjoys the segment's namesake chocolate. Subaru will sponsor the game's "Drive of the Day" as well as appear during several ad breaks featuring its "Dog Tested. Dog Approved" ads. Mars is the game's solo multi-platform sponsor, appearing online at Animal Planet's Puppy Bowl microsite as well as sponsoring the on-air and online "Starting Line-up" segment. Other marketers in this year's game include the American Animal Hospital Association, General Mills and Progressive Auto Insurance. Sharon O'Sullivan, Animal Planet's senior VP-ad sales, said advertiser demand for this year's event reached an all-time high, to the point where several clients were turned down for on-air buys due to category exclusivity with key sponsors. 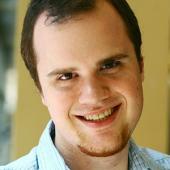 "We have become the campy alternative to all the prime-time shows. Advertisers like that it's fun, and there's a great association. It's something that works for them and the consumers," Ms. O'Sullivan said. 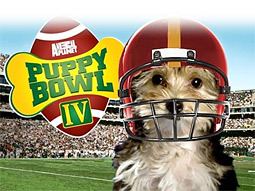 While the "Puppy Bowl" hardly pulls Super Bowl-level ratings, it's routinely one of Animal Planet's highest-rated shows of the year, pulling in a collective 7.8 million unique viewers during a February 2009 marathon and 1.1 million viewers during last year's live telecast. For Hershey, the "Puppy Bowl" represents a more irreverent -- and much cheaper -- alternative to the Super Bowl, which fetched more than $3 million a spot this year. "The commentators within the Twizzlers Blimp are hamsters, so it's a fun, cute way to incorporate a lot of the same energy and excitement that comes along with the Super Bowl and leverage a lot of those fun elements in a way that's relevant to the Puppy Bowl," said Hershey spokeswoman Jody Cook. Ditto Subaru, which avoided a Super Bowl buy in favor of a more targeted dog-themed ad buy this year across Animal Planet, USA's "Westminster Dog Show" coverage and National Geographic Channel's "Dog Whisperer," among others. "Our goal is to emotionally connect with our customers rather than all customers, and the Super Bowl is an all-customer type of medium," said Subaru spokeswoman Heather Ward. Ms. O'Sullivan said the "Puppy Bowl" has helped define Animal Planet even as the network continues a two-year rebranding process to broaden its programming to more reality-based fare in hopes of attracting a wider audience than just pet owners. "It's probably the one show still on the air and doing really well for us over the last five years, and the one show where we've innovated the sponsorships that it's something people come to expect from Animal Planet," she said. "It's part of our history, and we see it being a really strong part of our future."